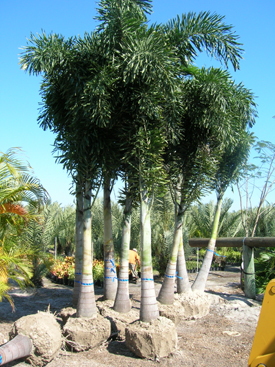 If you are interested in buying wholesale Palms in Clearwater Florida, then you have come to the right place. Upon the mention of the term palm trees, the first thing that comes into your mind is a relaxed lifestyle under the sun, white beaches and vacation. Florida is full of palm trees along the coasts, shopping malls and in the streets. A home is a place that should reflect your values and tastes, hence should the only place you enjoy being the whole time. Moreover, you can customize your residential area compound with the numerous selections of palm trees that are at your disposal from aqualityplant.com. The market value of your asset can rapidly increase due to the use of palm trees we offer to landscape your compound making it have a vibrant energy and colorful look. We have wholesale palm trees in numerous species available globally and the good news is that they can be grown in Florida without any difficulty. Nevertheless, at a quality plant.com we offer various species of wholesale palm trees with different types of size, colors, and shapes that can give your compound a magnificent look and peaceful oasis all over the place. Here are the favorite types of palm trees we have at your disposal that can add value to your property available in a quality plant.com. The Cabbage Palm Tree, also known as the Sabal Palm tree is one of the best cold hardy wholesale palm trees found to landscape your compound. It has gained its popularity due to its ability to withstand harsh weather conditions and numerous types of soils. They create an appealing appearance to your front door adding more value to your land. Another Palm tree we offer you at A Quality Plant offer is the popular Queen Palm Tree. It is good for landscaping a compound due to its low maintenance and attractive look. Moreover, this tree is pocket friendly and when grown in groups of four or more provides a perfect shade for your garden. The Canary Island Date Palm is a dazzling species, mainly for landscaping and also planted along the streets for the purpose of lining the streets and city parks. These beautiful Palm specimens when pruned have a pineapple characteristic appearance. We at A Quality Plant offer you this specimen which is a fast-growing Palm tree and also affordable. These palm trees available in Wholesale to Clearwater Florida provide your compound with excellent shade and act as windbreakers especially when the Floridian wind blows. If you want to add value to your property, then make an order of your favorite Wholesale Palm trees from A Quality Plant now and watch as your asset attract more clients by the day.